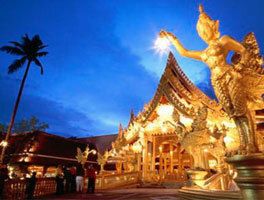 Why book Phuket Airport car rental at VIP Cars? Rent a car at Phuket Airport with pricing inclusive of CDW, Theft Waiver, Unlimited Mileage etc. Pre-book a cheap car hire at Phuket International Airport from VIP Cars and save big on your traveling cost. We have been successfully helping hundreds and thousands of travelers in finding them their perfect car rentals for HKT Airport by providing them with a variety of deals which cover all budget ranges with no compromises on quality!! Moreover, with us, you can search and compare HKT Airport car rental deals, quoted by some of the top suppliers in the market, at one place. 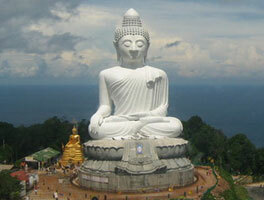 Book your Phuket Airport car rental today and save money on your next trip to Phuket, Thailand! Long term car rental Phuket: Renting a car for a longer duration of time is the best way of ensuring that you save big with no compromises on the car-type you are looking to rent. Long term renters get really great rates from the suppliers. Mostly preferred by business people, the combined fleet of our car hire partners have all from a BMW, Rolls Royce to Audi and Mercedes. If you want to hop from one beach to the other, in addition to convertibles, many renters go for jeeps for a memorable ride. On VIP Cars, you can compare a big list of vans and minivans from 7, 8, 9, 12 to 15 seater vehicles, all at one place, saving you time and effort. Economy, compact, mini and sedan cars are the cheapest to rent vehciles and are easily available. Business or leisure, they are made for budget travelers and are great for city travel. All the aforementioned extras are inclusive of our final quoted prices and carry no additional/hidden charges. Also, note that it is a tentative list, it may vary from supplier to supplier. As different suppliers offer a different set of extras, the above-given list is provisional and can vary from supplier to supplier. Cross-border car rental is strictly prohibited in Thailand. On doing so, all insurances lose their validity and the driver has to also bear a penalty amount. The usually observed minimum age limit is 21 years; however, we must notify that it completely depends on the supplier with whom you are renting a car. Also, note that drivers falling under the age segment of 25 years might have to incur an additional 'young driver’ surcharge. Phuket Airport is the second busiest airport in Thailand, in terms of both passenger traffic and freight volume. HKT Airport is the primary gateway to the Phuket Island- a tourist paradise situated in the southern part of Thailand. HKT Airport serves as an operating base to over 10 airlines, handles over 14 million passengers every year and is comprised of two terminals and a single runway. It plays a vital role in promoting travel and tourism in the southern region as well as throughout the kingdom. It offers food, coffee and beverages. It serves food and drinks. It offers all from Burgers and Breakfast to veggies, sweets, sides and kid’s meals. Besides it much-loved sandwiches, it offers breakfast as well as Salads. In addition to Crispy Veg burgers, it also offers sides and beverages. Its menu offers delicacies like Shrimp Burger, grilled salmon and chicken. Here one can choose from a variety of coffees and sandwiches. The restaurant also has a coffee shop. Here you can eat burgers, snacks, coffee, and beverages besides its world-class donuts. Here you can have some of the best homemade soup, chili and appetizers. If you want to have the best of both the brands, it is definitely the place for you! Menu highlights: Candy Cane Chill Blizzard and Oreo Hot Cocoa Blizzard Treat. Besides Ice creams, it also offers beverages and bakery snacks. Phuket is best-known for its beaches. Instead of hauling for taxis and wasting your time and money, rent a car at Phuket International Airport and drive straight to the best beaches in Phuket Province. Average Time: 1 hr 15 minutes. Here is a sample itinerary that you can use, so, make the best use of your vacation time while driving from Phuket to Bangkok in your HKT Airport car rental. Leaving Phuket without experiencing Koh Yao Noi will leave a big hole in your conscience. So don’t miss it at any cost! From the airport, you can directly reach the Rassada Pier in less than 25 minutes; from there you can get a ferry. What documents do I need if I want to hire a car at Phuket Airport (HKT)? To be eligible to rent a car at HKT Airport, you need driver's license issued in your name, a credit card (bearing the name on the driving license) and a passport (or any other identity proof issued by your native country). Do I need to have an international driving license? As per Thai law, every driver needs to have a driver license, no matter by which country it has been issued, it can be Thai, overseas, or international driving license. Is there any additional charge for additional drivers? It totally depends on the supplier; while some suppliers offer additional driver add-on, free of charge, others charge for it. Add-ons appear at the last stage of booking. What do I have to know before driving in Phuket, Thailand? 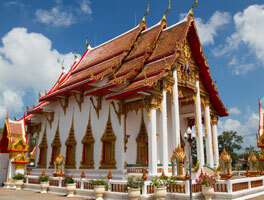 Keep the following points in mind while driving your car rental in Phuket. You must always have your driver's license while driving; and if not that then, the international driver's license. If there are passengers accompanying you in your HKT Airport car hire, make sure that you and the passenger sitting in the front are wearing the seat belt, at all times. Do not exceed the speed limits. It is 60 km/hr on the city roads and 90 km/hr for the highways. Never drink and drive; if you are stopped and the driver's blood alcohol level is more than 50 mg. percent, it will be counted as a major offense. Phuket Island is full of curves and hills, especially the area near Patong Beach, so always keep vigil and drive carefully. Keep an eye on the motorcycles! They are notorious for their inability to follow traffic laws. Be careful! Note that in Phuket Town, there are many areas – major beaches and business area – which have one-way roads, so plan your route accordingly. How is the parking situation in Phuket? It’s not hard to find parking space in Phuket, you will be able to find a parking space for your HKT Airport car hire. It is also seen that most hotels offer free parking service for their guests, and if you are able to find a public area, you will be glad to know that most of them allow you to park free of cost (exception: busy area!). It is easy to find a parking space for your car in Phuket, except in some busy roads in Phuket Town and Patong Beach, so never park your car on the roadside unless there is a sign which states that 'you can’. It is so because, if found, police may lock your car using chains; in that case, you will have to visit the police station to pay penalty, then only your car will be released.